I was prompted to write a brief Runway Report for my Fashion Business class on one of the designers from a Spring 2013 RTW runway show and wanted to share my thoughts with you all! 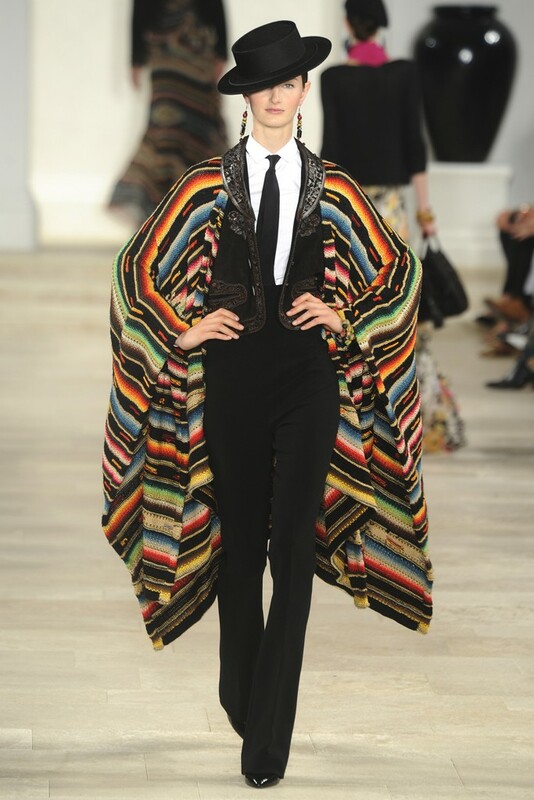 Ralph Lauren’s show was presented beautifully. A vibrant color palette filled with stunning patterns showed incredibly well against a creamy white runway. The models entered through a Spanish-influenced archway and passed under wrought iron light fixtures to establish consistency through Lauren’s Latin themed collection. The front row was studded with stars by the likes of Jessica Alba, Olivia Wilde and Patrick Demarchelier. Ralph Lauren offered up a seemingly paradoxical representation of the Latin lands. So much of the world’s focus is often placed on the economic credit standing of a country. Ralph Lauren reminded us that riches can be found in unexpected places. He infused elements of detailed embroidery, beading, leathers and lace that represent notable and cherished components rooted in traditional Latin garments and costume. Contemporary silhouettes lent themselves well in helping to put a modern spin on such historical references. The extraordinary tailoring, fit and styling were in line with what Lauren’s line typically represents. He takes a very literal approach when incorporating his inspiration into his collections. This season’s ready to wear collection was no exception to this rule. Lauren’s vibrant palette, strong silhouettes, and heavier fabrics stood out against some of the more muted tones and whimsical textiles used by designers like Mara Hoffman, Lorry Newhouse, and Rebecca Taylor. All in all I think Lauren’s 80th showing was a tremendous success. I feel that he stretched his own boundaries and took an avenue that was not necessarily expected of his house. This entry was posted on Friday, October 19th, 2012 at 8:24 AM	and tagged with fashion, fashion design, RTW 2013, spring fashion and posted in Fashion. You can follow any responses to this entry through the RSS 2.0 feed. Thank you! He’s fantastic and one of my fashion heroes. He deserves all of the success he has seen!